During our Spring and Fall Black Bear hunt, we have access to 3,245 sq. kilometers in zone 5 and also 6,265 sq. kilometers in zone 7. These two zones are mainly covered by dense spruce forest which is an ideal habitat for the bears. We take Trophy Book animals every single year! One of our hunters videotaped 71 (yes, seventy-one) bears during his one week hunt with us. For the last 8 hunting seasons we have reached a 100% opportunity-for-a-shot at a bear for every hunter. Since all our stands are set up for archery, all hunters can examine their quarry at close range. We DO NOT leave hunters in the woods until late in the night. ALL hunters are assisted out of the woods prior to recovering any bears after dark. Client safety and success are our first Priorities! We have been fortunate in securing access to a private hunting property 8 years ago and have been feeding bears (growing bears) since then. This property has never been previously hunted in order that one day we might offer Trophy Bear Hunts on a limited basis. We will only offer one of these hunts per year and since we now have a number of Trophy Candidates on the property. We are offering a 5 day hunt for a Trophy Bear weighing at least 300 pounds or more. I will sit with the hunter and tell him if and when to shoot and I will video tape his hunt. We will hunt grouse/partridge in the morning and then head to the bear stand for the evening hunt. This hunt will take place in mid-October only one week before the bears go into hibernation so sightings will be numerous since the bears are feeding constantly to pack on as much fat reserves as possible just before going into their long hibernation period. This is a Limited Exclusive Trophy Bear Hunt Package! For this hunt, the hunter must understand that we will only shoot at 300 pound plus bears and if smaller ones show up we will pass on them. This hunt package should go quickly so avoid disappointment and book your exclusive Trophy Hunt now. The 2019 application period extends from February 5th to April 30th. Our 5 day Moose season may be short but it is very exciting. The New Brunswick Government has made a limited number of tags available to non-resident hunters. We have been most fortunate to have a hunter every year since 1996 and we are proud to say that we have experienced a 100% success rate in the Moose hunt! Mark Unger harvested a 695 Lb. six point bull in 2002 and James Kelly bagged a 765 Lb. 13 point bull in 2003. In 2004, Bob Jarvis harvested a 750 lb. 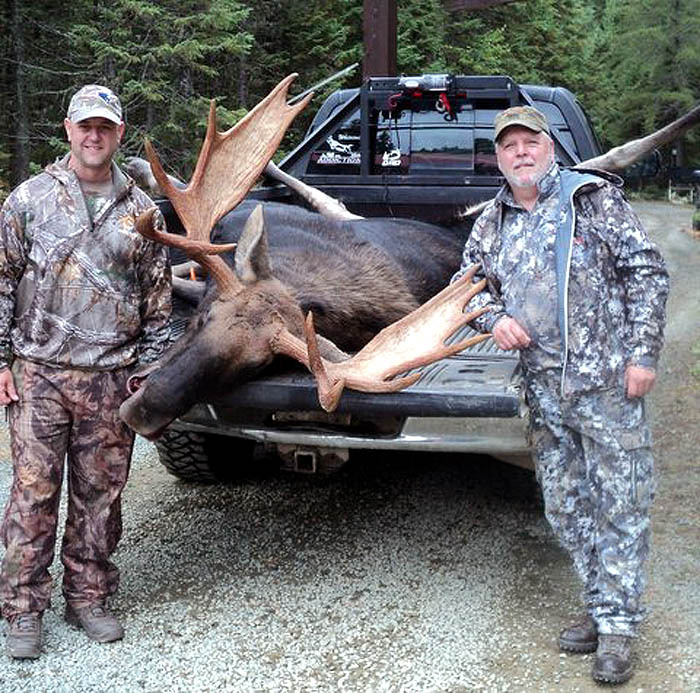 cow moose, Mark Unger a 1,020 lb. bull, Edward Khun Jr., a 300 lb. bull and Bear Paw guide David Roy, a 650 lb. bull. During the 2005 moose season, Jim Keneston from New York harvested a 752 pound bull moose and Maureen Roy (co-owner Bear Paw Outfitters) harvested a 870 pound bull moose. During the very successful 2006 moose season, Peter Brown from Maine harvested an 890 Lb. bull with a 53 inch spread and 18 point rack. 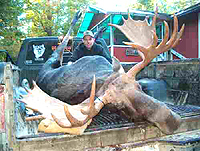 Steve Wendzel of Pennsylvania harvested an 809 Lb. bull with 44 inch spread and 21 points. Our 2007 moose hunt was once again very successful with John Drew harvesting a 880 pound bull, with 14 points & 42 inch spread. 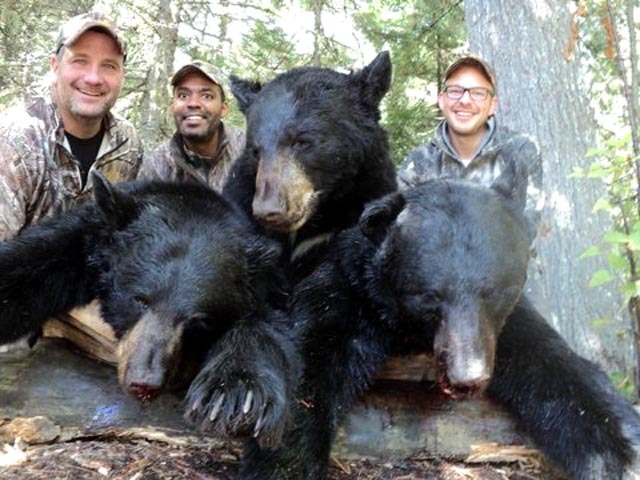 Elwood Brutt harvested a 900 pound bull, Larry Gray harvested a 700 pound bull and finally, Bearpaw outfitter guide Kenneth Gauthier harvested a 550 pound 3 point bull. In 2008, Wade Beck harvested a big Bull with a 42" antler spread and weighing in at 895 Lbs field dressed. 2009 was again a successful Moose hunting season with Jim Morrow from Michigan harvesting a big 900 Lb 47" spread bull using his Matthews bow, also Mrs. Elodie Hache harvested a 600 Lb 7 point bull. 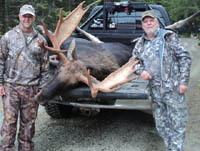 The 2010 moose-hunting season was a successful one with Mr. Ray Lovell of Illinois harvesting a 715-pound bull moose on the second morning of the hunt. The hunters saw 13 moose in 2 days. The 2011 season was a great success with Mr. Mike Kline harvesting an 825 pound 14 point bull, hunter Bernard Fiset harvesting a 790 pound 12 point bull, and once again, Mrs. Elodie Hache quickly harvesting a 700 pound cow moose in the first five minutes of the season, and finally, owner/operator Mike Roy harvesting a 750 pound 10 point bull on the last day of the hunt. In 2012 we hosted Dr. C S Oosterveen for a moose hunt. He passed up on a cow on opening morning but the very next morning, on the way to the stand, he and his guide came upon a giant bull which they harvested. It had a 54 inch spread and field dressed at 950 pounds. A few minutes later they came upon another giant bull which they estimate to have an antler spread of well over 60 inches. Dr. Oosterveen will be back here again for another hunt. The 2013 season saw Mr. Gerald Hache harvest a 4 point bull only 500 yards from the lodge. The hunt was short and exciting and the hunter managed to get what he wanted - and that was excellent meat. In 2014 we hosted hunter Peter Mosco who harvested a 756 pound 11 point bull on the 2nd day of the season and also on the forth day of the season, Mr. Ray Lovell who successfully made the first-ever archery harvested moose at Bear paw Outfitters, with an 810 pound 8 point bull. Earlier in the hunt, Mr. Lovell passed up on 6 other moose that presented a shot. 2015 was an overall success! We had a hunter who wanted to take a 50 inch bull moose on a spot & stalk hunt. We had never done this before since we always hunt out of tree stands and call the moose to us. Well, we took on the challenge and our hunter saw 32 different moose in 5 days - many of which were bulls and one 50+ inch bull came in to 7 yards from the hunter - but with bushes obstructing the vital area and a shift in wind he could not get a shot. On the last day and final moments of the hunt and on the request of Mike (the outfitter) the hunter shot a nice bull and filled the tag. The hunter said it was the most adrenaline filled hunt he has ever been on and hopes to draw another tag and do it again. The 2016 moose season was once again a great success. We hosted 3 non-resident moose hunters and one resident. By 7:30 am of the 2nd day of a five day season we had killed our 4 moose. Mr. Stan Cope harvested a 900 pound bull, Mr. Greg Bauer a 750 pound 6 point bull and Mr. Richard Deroche a 700 pound 4 point bull. Mr. Deroche and his guide Al walked to their stand at daybreak and he did not even have time to get up into his stand because there were 4 moose in the pond in front of them and in all the confusion, Mr. Deroche shot a 4 point bull but one with a 55 inch spread just stood there then ran into the bush. We have all had one of those moments and it keeps us coming back for more. Mr. Cope had airline delays and missed the first day of the season. The outfitter picked him up at the airport and at 7:00 am the next morning, he and outfitter Mike saw a small bull which they passed on and 30 minutes later, about one mile away, they came upon a real nice 900 pound bull which Mr. Cope put down with one shot. Since he still had 4 more days left in New Brunswick, Mr. Cope turned to bear hunting and managed to harvest 2 black bears before returning home. Mr. Greg Bauer took a 357 yard shot and harvested his bull on the first morning of the hunt. Next year will be awesome as the season will be right into the prime rut, being the last week of September. For the 2017 season we did not have a single moose hunter - none of our hunters drew a tag in the moose lottery system. Nevertheless, we went and sat in our tree stands 3 days out of the 5 day season and called in 7 different bulls and had others show up on our trail camera so 2018 should be a great season. 2018 was once again a great success with both our hunters harvesting good bulls. Mr. John Didonna harvested a 50 inch, 13 point 950 pound bull. Mr. Didonna was guided by outfitter Mike Roy during the first 2 days of the hunt and had one bull come in to the call but would not commit enough out of the brush to get a clear shot. Fortunately, another bull was called in for a shot and harvest. Mr. Andy Klauss harvested a 36 INCH, 10 POINT 800 POUND BULL. Mr Klauss passed on 4 other moose while on stand. Overall an excellent 5 day season and from the 3 other giant bulls that we called in after the season, we are expecting another fantastic hunt next year. All towels & Linen supplied - bring personal items. Licenses & Tags available at lodge. Registering of game at lodge. Preparation of all permits required to get Trophy home. Skinning of game (head and paws in). 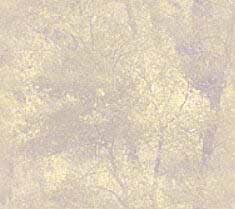 Salting or freezing of hide. Bow & Arrow repair equipment available at lodge. Professional Taxidermy service (additional cost). 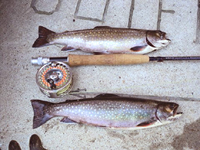 we offer excellent native brook trout fishing. fisherman exciting action and a memorable wading experience. where some great fish are taken every season. Call for information.